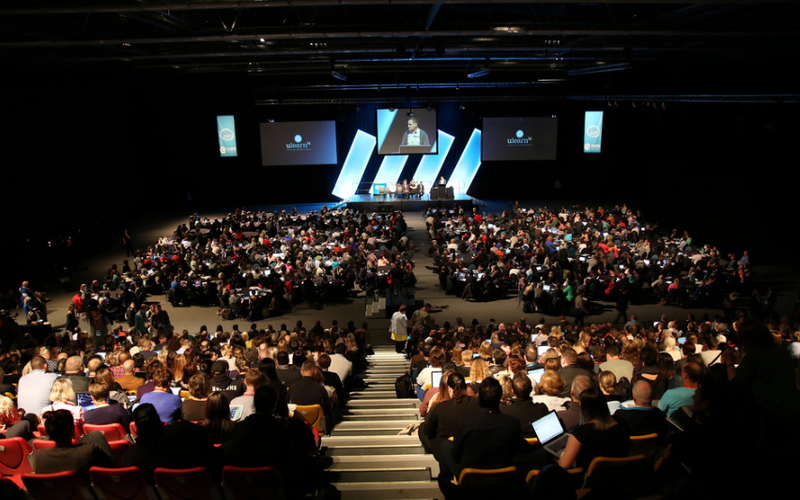 The ULearn14 conference has ended for another year, with around 2000 people gathered at the Rotorua Events centre for four days (incuding pre-conference workshops) of professional stimulation, challenge and connecting. The #Ulearn14 Twitter stream was trending high through the conference and provides a great insight into the multi-faceted event. Many teachers have been active since the conference, providing their personal reflections on the conference, such as this blog from AnneMarie Hyde, or this storify from Vanessa Cancon. For a number of years at this conference I have heard comments to the effect that "it's all about the pedagogy, not the technology" as people pass through that point in their own awareness and understanding – moving beyond simply focusing on the tools, and instead thinking about the way in which these can be used to support, enable and inspire deep learning. This year I felt, for the first time, that this level of awareness and understanding is a part of the system thinking, rather than simply the experience of indviduals. The level of engagement in pedagogical discourse was raised to a new level in the workshops, the reseach strand and the keynotes – exciting stuff! From day one the keynote speakers certainly inspired us to think this way. Their presentations created a level of cognitive dissonnance that forced us to wrestle with the ideas presented, challenging our assumptions and 'comfort' with existing practice – and while the response to these messages was rather polarised (as Steve Mouldey reflects), the overall impact was to add a depth and dimension to the conference that we haven't seen before. 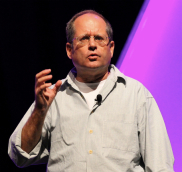 Here's my summary of the keynote messages..
Yoram Harpaz – described three ideologies that underpin the work of educators and define what happens in a school or school system – then created a cognitive dissonance in challenging us to make the tragic choice! Whether we found ourselves agreeing or disagreeing with having to make such a choice, no-one could escape the challenge he created in confronting how these ideologies shape our personal and collective view of teaching and learning. See the collaborative document of notes from his presentation. Adam Lefstein – challenged us to think more critically about the professional conversations we have, and understand how this discourse shapes what we see happening in our classrooms and the lives of our learners. We learned from him that professional discourse is not a bragging race on your students or colleagues – it’s about getting better from learning! See the collaborative document and a Storify collection of notes from Adam's presentation. 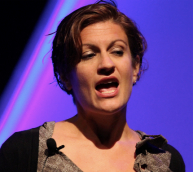 Katie Novak – introduced us to the fascinating world of Universal Design for Learning, equipping us with a systematic way of ensuring that the needs of every learning is planned for before the lesson. She capably demonstrated how this worked both what she shared and how she shared it. See the collaborative document of notes from Katie's presentation. Quinn Norton – tantalized us by the description of her studies of emergent feral network collectives. 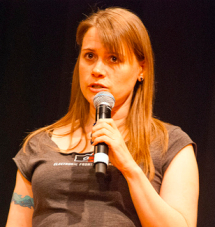 She challenged many of our pre-dispositions about the internet and those who use it, about hackers and hacker spaces, and about how we accommodate and engage the learners in our classrooms who are likely to be a part of these communities. See the collaborative document of notes from Quinn's presentation. With this event now behind us, it's time to consider how to continue the professional learning that has inspired us. There are plenty of opportunties still taking place in the Connected Educator Month activity until the end of October – and then there's ULearn15 to look forward to, with planning for that event already well under way! One of the workshops I presented at the DEANZ14 conference in Christchurch focused on how we can use the concerns based adoption model (CBAM) to underpin the strategic planning of professional learning programmes within our institutions. This slideshow above is what I used for the workshop. DEANZ is a professional organisation that I have belonged to for over 20 years. It enables me to connect with other educators involved in the open, flexible and distance learning field – with a good mix of researchers and academics involved. I strongly encourage anyone whose work is in this area to attend – it's a unique opportunity for you can meet and interact with the other professionals from univeristies, polytechs, schools and other sector groups whose work is similar to yours. Registration is open for the DEANZ14 conference, “Open, Flexible and Distance Learning, where is the ‘e’ in engagement?” DEANZ14 is the premier conference in Aotearoa New Zealand for leaders and practitioners involved in open, flexible and distance learning. The conference will be relevant to tertiary and secondary educators, including librarians, and those company trainers seeking professional and organisational development that DEANZ supports. You can get more details on the DEANZ conference web site and brochure here and Register by clicking here. Members: $675 inc GST registration (early-bird rate) which includes rejoining DEANZ for two years $120 value). Non-Members: $775 inc GST registration (early-bird rate). The call for proposals is extended. Non-refereed papers, digital posters, workshops, round tables and exhibitions are all invited for the event. Refereed papers deadline has passed however if you have a proposal please contact Professor Niki Davis. Refereed papers. Abstracts of 300 words are invited for review. Please email your abstract with ‘DEANZ2014 Refereed paper proposal’ in the subject line to 2014DEANZ@gmail.com. Instructions for submitting full papers through the DEANZ Online Journal System will be provided to authors. Full papers will be between 3,000 and 6,000 words and will be peer-reviewed. Decisions based on abstracts for refereed papers will be made within a two week timeframe, where requested. Final refereed paper submissions now closed. Accepted refereed papers will be published in a special issue of the Journal of Open, Flexible and Distance Learning http://journals.akoaotearoa.ac.nz/index.php/JOFDL. Non-refereed papers. Abstracts of 300 words are invited. Please email your abstract with ‘DEANZ2014 Non refereed paper proposal’ in the subject line to 2014DEANZ@gmail.com. Non-refereed presentations will not be published, however any slideshow or accompanying notes will be made available through the DEANZ 2014 Web site. Digital Posters. Please email a 300 word description of the proposed digital poster with ‘DEANZ2014 poster proposal’ in the subject line to 2014DEANZ@gmail.com. Digital Posters (up to 100 MB in size) will be linked to the Deanz website with the opportunity for blog posts to be added by the author and those viewing the posters during and after the DEANZ14 conference. Authors must be able to access the website and post and reply to blogs about their digital poster. Workshops. Workshops of up to one hour are available. Please send an outline of your proposed workshop (including any technical requirements) with ‘DEANZ2014 Workshop proposal’ in the subject line to 2014DEANZ@gmail.com. Round table. Round table sessions of up to 40 minutes are available. Please send an outline of your proposed round table (including any technical requirements) with ‘DEANZ2014 Round table proposal’ to 2014DEANZ@gmail.com. You will be advised of the outcome of your proposal by Friday 28 February 2014. Selection of presentations will be based on the relevance of the submission to the conference theme and strands; likely interest to conference delegates; and contribution to open, flexible and distance learning theory and/or practice. With the support of our partners InternetNZ, Creative Commons Aotearoa New Zealand is hosting three free introductory sessions to Creative Commons licensing in New Zealand schools. 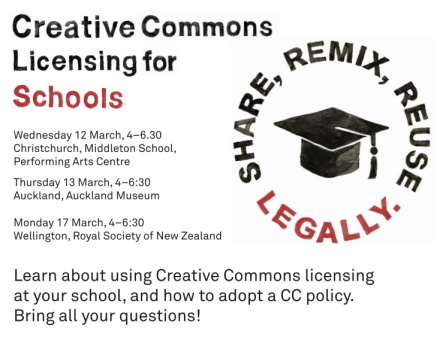 Come along to learn everything you need to know about Creative Commons licensing and Creative Commons policies for NZ schools. The format of the event will be a series of ‘lightning talks’ of eight minutes per speaker, leaving plenty of time for questions and discussion. Coffee, tea and sandwiches will be provided. To register for these free events, fill out the form on the Creative Commons Licensing for NZ schools website. If you want to help advertise these events, please download the A4 flyer. Those who didn’t have to rush away to catch a plane were privileged to hear eminent historian, writer and academic, and current New Zealander of the year, Dame Anne Salmond as the final keynote at the ULearn13 conference. For me there couldn’t have been a more fitting climax to the conference. Dame Anne’s message brought the perspective I’d been hoping for – a well articulated case for why we must be striving to see change in our education system if we’re to prepare our young people for the future they face – and deserve. Dame Anne expertly combined personal stories, historical perspectives and elements of contemporary philosophy to describe possible futures in New Zealand, and the idea of education as a journey. She quoted her personal mentor Eruera Stirling who once told her that thinking of learning as a journey "helps your footsteps to find the right pathway." Here teachers give their students the confidence and skills to navigate towards new horizons. Teachers stand at the nexus between our children and their future. No pressure here, just a challenge for us all as educators to consider what really drives what we do – the 'why' question again. Dame Anne repeatedly asserted that every child is a Taonga. Our children are our guarantors of our future happiness and prosperity. She illustrated how in pre-European Māori tradition, children were afforded a special place in everything that occurred on the marae. They were not separated from the world of the adults, and so their learning was in the context of the everyday affairs of the marae and its people. She contrasted this with the influences on our current Western society, citing the great chain of being that has left us with a legacy of hierarchical, top down structures and processes in almost every fact of our society. This approach, so ingrained in our thinking and behavior, can be seen in everything from the structure of our corporations and governments. For me this was of particular significance, as I am immersed currently in thinking about modern learning environments and how these might be conceived of and developed. Dame Anne’s address has been helpful in understanding from an anthropological and socio-cultural perspective the tensions that exist in our discourse and behavior that cause us so often to retreat to what is known and familiar (the order of things) rather than take risks and explore the more open, connected and heterarchical approaches that will ensure our future – and the future of our children, our taonga. If there's one thing I've taken from this conference it is the re-kindled determination to more consciously resist the traditional, hierarchical 'chains of command' that exist in our workplaces, our schools, our classrooms, and activley support alternative approaches. These are anathema to the state we should be endeavouring to create, and everyone who succumbs to this way of thinking becomes a block to progress being made. 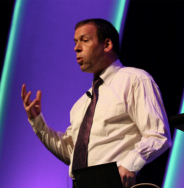 Mark Pesce’s opening line was “at this moment, education is at its biggest crisis that it’s been in for centuries!” Now there’s a comment bound to polarize people – and it seemed to work. Not that that’s a bad thing, because whatever side of the debate you might find yourself, it helps to sharpen the receptors for what’s coming next! Mark went on to explain that this crisis presents the greatest challenge and the greatest opportunity in education. So what is the crisis he was referring to? It’s the challenge of connectedness – the fact that everything is now challenged because all of us are now connected all of the time – to all forms of information and recorded knowledge, to each other and to events. Mark cited the example of Wikipedia which has matured into a definitive, online factual resource. “We didn’t know what was coming with Wikipedia until we got it – couldn’t see that this heralded a new form of knowledge creation and sharing until it happened” he says. In this connected world we absorb the learning of others. Where imitation was previously bounded by proximity, it now has global scale. We’re learning from everyone all of the time – this is natural behavior, in our genes, but is now being amplified beyond the scale that any formal system can contain. The challenge then is how does the classroom cope with that? How does the educator face this challenge? So what will be left for teachers to do – if students are going to have such unfettered access to the vast knowledge store of the world? Pesce argues that educators are going to be left with the ‘hard problems’ – the problems that can’t be solved through peer mentoring. Professional educators will step in to bridge the gap where existing knowledge sharing and peer mentoring fail. There will be a tremendous cultural and institutional pressure to connect children before they’re ready or prepared for this. Connectivity doesn’t immediately imply wisdom. Pesce argues that if we resist the tide of change we will be swept away by it. So we need to assess what needs to change if we’re to enter the era of hyper connected education. Situated within a networked community, connected learners can begin sharing across timezones, languages, cultures, – a classroom on a global scale. In such an environment, how can anything be centralized? Scaffolding for this must begin in the first years of formal education. Without these skills meaningful participation in a culture of shared knowledge building is impossible. This raises the issue of assessment – most often performed today by separating students from the resources they need to complete the assessment. In a pervasive sharing culture, assessment is intrinsic to the act of sharing – you cannot share unless you have some level of expertise. Every moment of peer mentoring will be a moment of assessment. Mark expertly made the case for a radically different approach to assessment in our schools – moving the focus entirely from a measurement made at the end of a period of study, to something that occurs throughout the learning process. He argues that this fits perfectly within the culture of a competency-based curriculum. Students learn to assess and be assessed by their peers to power their way through a curriculum. 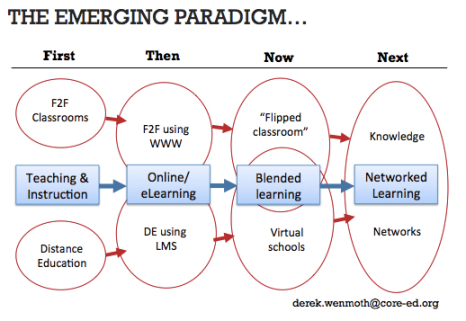 Mark’s keynote had me following every word – it was one of the most well articulated explanations of and case made for connectedness that I’ve heard, and supports the premise that I’ve argued for some time now that this is one of the three ‘game-changers’ for 21st century learning as illustrated in the diagram below. It was my pleasure to interview Mark immediately after his keynote for a video that will soon appear on EdTalks. Meantime, there’s a shared Google doc containing the thoughts and comments of delegates who heard him speak. US Educator, Ken Shelton, was the opening keynote for this year’s Uearn13. When he received his invitation to come to NZ to speak at ULearn13 he said he was so excited he thought he might swim! Ken’s presentation provided a perspective of a youthful, enthusiastic and optimistic user if ICTs as a vehicle to engage and motivate learners. He modeled this by making extensive use of online tools – including a collaborative backchannel on TodaysMeet which was used by delegates to record their responses and reflections on the things Ken shared. As he noted, “the smartest person in the room is the room” and so this provided a space for delegates to add their collective wisdom. Unfortunately Ken experienced a little difficulty near the beginning of his talk, just as he was connecting us to an online polling site – thanks to a contractor somewhere in the North Island who managed to severe the fibre connection, causing it to be re-routed through a ‘throttled’ line – causing problems for the more than 1000 concurrent users attempting to connect to an international site at the time! Despite this, Ken made a valiant come-back, and went on to challenge us to think about “What does it mean to transform?” and “What does transformation look like?”. The transformation theme was really at the heart of his message, urging us to think about how we need to consider embracing the opportunities that ICTs provide us with in education to actually transform practice, not simply replicate things we currently do by substituting new for old ways. This was a familiar message to many of the delegates who have been at the vanguard of ICT innovation for a while now, but for others it was a timely and refreshing challenge, reminding us new and inspiring ways that we cannot become complacent. Ken demonstrated that the foundations of pedagogy and learning haven’t changed – just our way of doing things. When it comes to using ICTs in the classroom, the foundations of use, the reasons for use etc. haven’t changed – but what we use, how we use it and what it does for us – the items themselves and the mechanisms of gaining access to them have changed. This, according the Ken, is where the transformation occurs. Ken emphasized that fun can change behavior for the better – using video clip of the Stockholm experiment changing stairs into a keyboard to illustrate how a simple thing can significantly alter behavior. If there was something missing from Ken's presentation from my perspective it was a more compelling argument regarding why this transformation is necessary. We've become very used to hearing speakers implore us to embrace these new technologies in our schools, frequently based on the argument that they create learning that is more engaging, more motivating and more authentic for learners. But this on its own appears not to be enough to convince the literally thousands of teachers and education leaders who don't attend conferences such as ULearn. Nor is it enough to convince politicians and holders of the public purse to invest the significant amounts of money required to provide the support and resources needed to achieve this. That said, the challenge Ken left me with was to think again about what it means to genuinely transform what we are doing in our schools – and in our education system. He also reminded me of how important it is to take risks and be creative in order to allow the real potential of the ICTs become apparent in what we’re doing. There’s plenty more of what Ken shared contained in the shared Google Doc that has been contributed to by many delegates. A recording of his full keynote is now available on EdTalks. I’ve spent the weekend relaxing after an intense four days in Hamilton at the ULearn13 conference with more than 1400 educators from New Zealand and a handful from Australia. It’s been an opportunity to reflect on the event and the things I learned and observed, and about the contribution of this event to the learning and development of schools across our country. I recall one of the first of these conferences (not known as ULearn then) that we organized back in 2001 (I think). Nick Billowes and his team were determined to include a conference like this as a sort of ‘staff meeting’ for teachers across the country who were involved in the ICTPD programme as it was then known. I was invited to present the opening keynote, after which there were just a handful of workshops run by NZ teachers. There were around 70 people at that event – and I recall the organizing group struggling to think of people they might invited to run the 5-6 workshops they needed for the programme. How things have changed! This is the thing that makes the ULearn event a little different from many other conferences. While there are the keynotes and spotlight presentations for inspiration, the 300 or so workshops run by teachers for teachers makes it most significantly a peer-to-peer, knowledge-building event. Further, the face-to-face workshops provide simply one aspect of this – the catalyst for connecting if you like. The extraordinary back-channel communication (e.g. Twitter and Google docs etc.) that is generated from these workshops creates a wealth of information for delegates to reflect on and use when back in their schools, and many of the connections made are continued well into the year ahead – sometimes leading to collaborative projects that become the topic of a workshop at a subsequent ULearn conference. As an example of this, this year we had a delegation of participants from the University of the South Pacific. A contact made at last year’s conference with Geoff Wood from Rosmini College led to a connection with teachers in Fiji as part of his ‘over the back fence’ project, which was presented as a workshop at ULearn13. With such a crowd of people it can be difficult to cater for everyone’s needs, but the organization of ULearn is underpinned by the same conceptual framework that all of CORE’s professional learning is based on. Using a concerns based adoption model (CBAM) as a guide, the programme is deliberately planned to include opportunities for people to engage in ways that meet their particular needs – as well as the needs of their school. But that’s an extreme example – the vast majority of people I spoke with and observed were making the most of every opportunity to connect, engage and learning with and from each other. In particular, it was again inspiring to observe and speak with many principals who had brought a number of staff with them to the conference, planning beforehand the things they wanted to focus on, and using the break times to reflect on and process the things they’d learned to ensure that when they return to their schools they have the opportunity to apply this new knowledge to the benefit of their students. To me this is the way the ULearn conference should be approached. The greatest value is realized when it is seen as a part of the ongoing professional learning within a school, and when school leaders and teachers see themselves as a part of the rich tapestry of a networked, knowledge building community that extends well beyond the boundaries of their own institution and of the timeframe of the conference itself.